For former presidential candidate, Abdel-Mon’eim Abul-Fotouh, perhaps not running for president again was not a surprising decision. In an interview with the Egyptian newspaper Al-Ahram last Friday, he said that he wouldn’t engage in ‘political cosmetics,’ a clear indication of how he viewed the current crisis in Egypt. He reaffirmed his opinion on Sunday by saying, ‘I won’t take part in deceiving people into believing we have a democratic path when we don’t.’ Abul-Fotouh’s assessment is an accurate reflection of the current political atmosphere in Egypt, however, his decision is also an indirect admission that he stands no chance of winning the backing of Egyptian Islamists, and non-Islamists beyond his core supporters in Egypt Strong Party. Unlike in 2012, in which some Salafists and the young Muslim Brotherhood backed Abul-Fotouh, this scenario is no longer possible. In fact, even in a free and fair election, the chance of Abul-Fotouh garnering more votes is very slim. He later acknowledged the mistakes committed by the Muslim Brotherhood from the beginning of the revolution through Morsi’s ill-fated presidency, and called for an early presidential election. 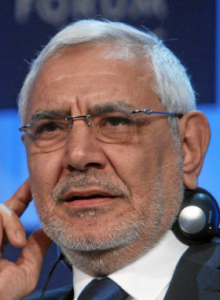 He has even described the June 30 uprisings as a ‘revolutionary wave that turned into a coup on July 3.’ Nonetheless, despite calling the ousting of Morsi a coup, Abul-Fotouh has refrained from joining the anti-coup sit-ins in Cairo’s Rabaa al-Adawiya and al-Nahda squares. He was content with criticizing the military-backed interim government for violently ending the sit-ins, a move that infuriated many Brotherhood supporters. Some even went so far as to call him a traitor. But American media has had a tough time acknowledging the dispiriting truth that Egypt’s presidential race is now a contest between theocratic Islamists such as the Muslim Brotherhood’s Mohamed Morsi and Abol Fotouh on the one hand, and autocratic former Mubarak regime officials such as Amr Moussa and Ahmed Shafiq on the other. Instead, the country’s major newspapers have gone out of their way to designate a hero. The Wall Street Journalthus whitewashed Abol Fotouh as “relatively liberal,” while The New York Times dubbed him a “liberal” outright. Any judicious reading of Abol Fotouh’s record would contradict these characterizations. In addition to Trager’s analysis, Dr. Aboul Fotouh has had an even longer history of extremist statements. Shortly following the U.S. invasion of Iraq in 2003, he accused the U.S of plan to “enslave the Arab nation.” In 2006, he continued along the same lines advising support for “a Hezbollah-Iranian agenda than an ”American-Zionist’’ one.” Egyptian journalist and political analyst Fady Salah has published an article titled “Aboul Fotouh: One Man Fits All” which looks at the history of contradictory statements made by Dr. Aboul Fotouh. In October 2013, the Middle East Institute published an interview with Dr. Aboul Fotouh. For an official bio of Dr. Aboul Fotouh go here.